TORONTO - Fierce thunderstorms caused havoc for the start of the Pan Am Games torch relay in Toronto, but the wet weather didn't appear to dampen the spirits of the hundreds of people who looked on as the torch started a journey on Saturday that will take it across Canada. The severe weather delayed the flame's scheduled arrival on a float plane that landed on Lake Ontario. It was put aboard a canoe crewed by some First Nations leaders and delivered to Toronto's waterfront. The heavy rain drenched athletes and supporters alike and the event was quickly moved indoors. Olympic gold medallist Rosie MacLennan was the first official torch-bearer. The headliner for Canada's trampoline team at July's Pan Am Games led supporters through the rainy streets of the city's downtown core as thunder rolled across the city's skyline. Ontario Premier Kathleen Wynne, federal sport minister Bal Gosal, Lt.-Gov. Elizabeth Dowdeswell and Toronto Mayor John Tory were on hand to show their support. 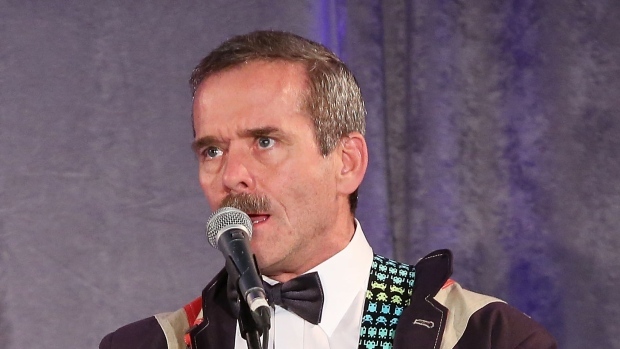 The final torch-bearer of the day was Col. Chris Hadfield, the self-described first Canadian to walk in space, who braved the pouring rain in Toronto's Distillery District to light a massive cauldron with the torch in front of hundreds of soaking wet onlookers. Wynne called the rained-out event a great example of "Canadian improvisation" and thanked the close to 10,000 athletes taking part in the Games. "Whether it was raining, whether it was snowing whether the wind was blowing, whether it was dark when they had to get up or whether it was light. They got up morning after morning and they've been training their little hearts out getting ready to come to compete," she said. Tory said the Games were a perfect example of how lucky Torontonians are and thanked the torch-bearers who represent "people from our communities who are drawn from every walk of life." Hadfield spoke to a crowd of hundreds about the honour he felt in being able to help kick off the festivities ahead of the Pan Am Games. "I represent so many generations of Canadian athletes, and athletes right across the Americas. I'm extremely proud to be a small part of that." About 3,000 torch-bearers will run legs of the 41-day relay that will conclude with the lighting of the official cauldron at the Games opening ceremony on July 10 in Toronto. The torch relay will visit more than 130 Canadian communities, travelling 5,000 km on the road and 15,000 km by air.